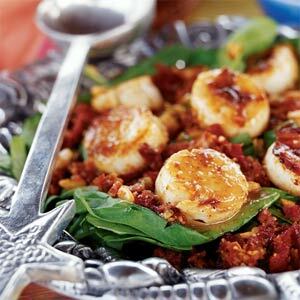 This restaurant seafood salad is a very special recipe that combines Scallops in a warm Spinach Salad and calls for roasted red pepper vinaigrette that brings everything together for a real culinary treat. When shopping for this seafood make certain these seafood items are plump and firm, with a sweet aroma. The best of these are creamy or slightly off-white. 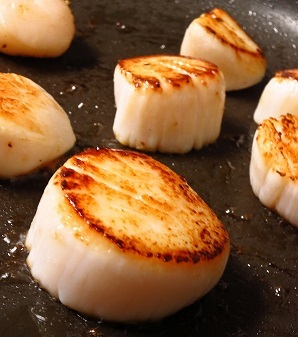 When cooked, each is opaque and just firm. Over cooking will make them tough. If you use large ones, it might be best to slice each one into two thinner pieces for more uniform cooking. This restaurant recipe is very adaptable. 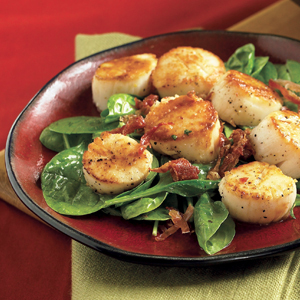 You can use a variety of seafood products with the warm spinach. The roasted red pepper vinaigrette complements all seafood. This IS a favorite restaurant recipe! Wow! You've got a winning seafood salad restaurant recipe! Thank you for visiting. ENJOY the restaurant seafood salad recipe and the company of those you share it with! Please "click around" for more recipes that work. Did you know? Saint James was the brother of John, and one of the 12 Apostles. 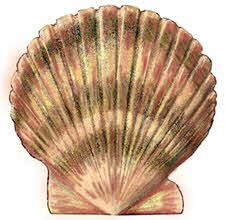 The scallop shell was the symbol of the crusaders of the Order of Saint James. (Santiago in Spanish and St. Jacques in French).